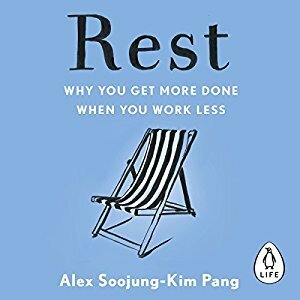 This is a review of the audiobook Rest: Why You Get More Done When You Work Less and how I am applying the various elements discussed in the book in my own life. I have been focused on maximising rest and free time in my life as opposed to income for the past few years but it is still hard to resist the general societal pressure to work hard and be productive. This book has given me some much-needed reassurance that my attempts to accomplish work in fewer hours and focus more time on restful and nourishing activities is not only not crazy but the scientifically and historically proven lifestyle choice of many great creators and achievers. Aside from this general validation I also got from this book a few aha moments and some practical tips on various aspects that comprise rest. These were covered in this book in detail with many historical examples and scientific studies quoted: naps, sabbaticals, exercise, walks, daily habit routines, engaging hobbies. Since I do not yet have children and have been engaged in active lifestyle design for many years now, I did not get put off or even noticed what the other reviewers seem to complain the most about – that the book centers around male historical figures with barely any women mentioned and that those figures would have had wives and servants arranging the rest of their life for them to do their work and rest activities. Being a woman and self-employed, I found all of the content relevant and applicable in my own life and am now actively experimenting with various strategies covered in the book. A few of the key ideas that I am now trying to implement in my life are listed below. I have always read naps mentioned in a lot of productivity and life hacking articles but the few times I tried to do it myself it was a complete disaster. I just laid awake for more than half an hour and felt nothing but frustration from the entire exercise. I concluded naps weren’t for me and never tried again. But the section on naps which not only gave historical accounts but broken down what kind of effects specific lengths of naps could produce inspired me to try again. This time around the success was almost instant and now I am working on making a nap part of my daily routine. I do not seem to have trouble falling asleep and wake up refreshed. My ideal outcome is that a nap in the middle of the day would allow me to reduce my nighttime sleep hours and most importantly, like the book have mentioned – create 2 days in the space of one. Another thing that always bothered me for a long time and I have always worked to reverse was the speeding up sense of how quickly the time passes. Creating an illusion of 2 days in place of one really appeals to my quest to create a more prolonged psychological sense of time for myself. This particular experiment did not go so well. While I always walk my dogs at least once daily in the morning and try again in the evening, the space that is available for my walks is rather limited to a few empty lots next door. While I am forever grateful for those lots and could not imagine who I would cope if I was simply sandwiched between two neighbours, I wanted to resume my longer road walks which I enjoyed when I moved into this place a few years ago. I strode out bravely repeating to myself mentally that I live in a residential subdivision at the end of a very long country road which is designed for its resident’s enjoyment. Just 2-3 doors down a truck came barreling down the road and ran over one of my dogs. This was the sad end to that venture. The dog lived, limped itself back home and the wounds are now almost healed but he probably won’t be able to use one of his back legs again but I remain optimistic. Some other options are still open to exploration like walking at 3 or 4 am which I practised briefly during my exploration of the night and silence. Or attempted seafront walks which are now also extremely challenging due to all the development. Going round and round in circles around one lot is what I continue to do daily with occasional 200m trecks out into the nearby bush or rocky shore. This one I struggle with the most. My life just does not seem to be able to follow a routine. And being a person with a very high degree of need for variability (as opposed to consistency) it really goes against the grain for me. I tried various approaches over the many months of the routine building attempts and so far haven’t found one that works. The Rest book says its best to get your work done early in the morning. And I tried to practice that only to realise that it refers to doing CREATIVE work while the majority of my day to day business duties are mostly administrative or technical-repetitive application of skills. So now I am experimenting with doing all my personal growth, creative and dome-keeping work during the day and generally taking it easy and doing the work in the 1-2 hours before sundown, using the sundown as the added time pressure (more on this in the next published review). So I really can not keep a routine of any sort for more than a few days but generally designating parts of my day to this type of work or that type of work is the best I can come up with. Having a long list of daily “habits” I wish to do helps steer me in the right direction from morning till night, but creating set rituals (doing one habit right after another then another) results in a complete failure. I understand the logic behind habit creation and that stacking them is the best way to success, but life seems to have other plans for me. For now I will stick with a general list of daily habits I wish to do (journalling, meditation, yoga) and let the pressure of this list and my mood dictate to me when and how each habit will be done rather than creating set steps of habits to be done at set hours of the day. In the course of listening to this audiobook I came to realise one important distinction: as I continuously work on minimizing my working hours, striving for more and freer time the way others strive for more and more income, I was faced with a dilemma that I do like the creative side of web development and get engrossed in the process but then regret when I feel that all I do day to day is “work”. So the distinction I came up with is that there is a more mundane “work” – emails, project management, bug fixes, basic maintenance. And there is the creative work – coming up with the vision of the new site, creating in broad digital brush strokes, finessing the details and making it “just perfect” in my view. I decided that I will continue to work on minimizing the routine work part of my business but allow myself to do creative work during my “free time” hours as a distinct decision to practice my “art” in those hours rather than a work commitment that has to be done. This was quite liberating and I hope will contribute to a more balanced view of my work life going forward. Engaging Hobbies (aka Deep Play). The book refers to various engaging and engrossing hobbies the many historical figures portrayed in it practices as “deep play”. I believe it attributed the quote to Winston Churchill which deeply resonated with me – that some personalities made for action cannot simply sit idly in their leisure time. To avoid being drawn to work more they need to find themselves an equally engaging and challenging hobby. I realised in that moment that my pursuit of “free time” will probably never be realised in the way I imagine it – sitting for long hours in the hammock reading or staring out to sea. There is just so much to do with a busy farm type household with 100+ pets and an entrepreneur mind on fire. So I decided that learning would be my focus from now on instead of leisure. It has always been my lifelong interest and one of the top things I regret not having enough hours in the day to do. So my affirmation has changed from “I am a woman of leisure” to “I am a woman of learning”. It has been liberating and has breathed new life into my attempts at a routine building. Furthermore, it is very hard to put down work when there is work to be done, just to play or do nothing. But it is much easier to convince my mind to put down work for the day so I can switch to my self-created curriculum and stay on top of my learning goals. It is all relatively new developments but suffices to say, learning feels like a very worthy and fun way to pass the time. When this paradigm shift first came about it felt like a point at which the trajectory of my life is changing forever. Too early to say yet, time will tell, but I am enjoying this new path of “learning first” life direction.